Conduct Risk is the latest buzzword in the financial services sector, and for good reason. Significant bank failures, large regulatory fines, and the waning of consumer trust in the wake of each scandal has brought a new focus to the question of how financial services organizations should grow value for shareholders while ensuring customers get fair outcomes. Globally, banking and insurance regulators have signaled that there will be an increased focus on conduct risk and risk culture going forward – a focus many organizations have already begun to experience. The concept of conduct risk fits naturally within a governance, risk and compliance framework – some would argue that GRC has been exploring conduct risk issues for a long time now. The panelists will explore how conduct risk fits into an overall risk framework, as well as into a GRC approach. 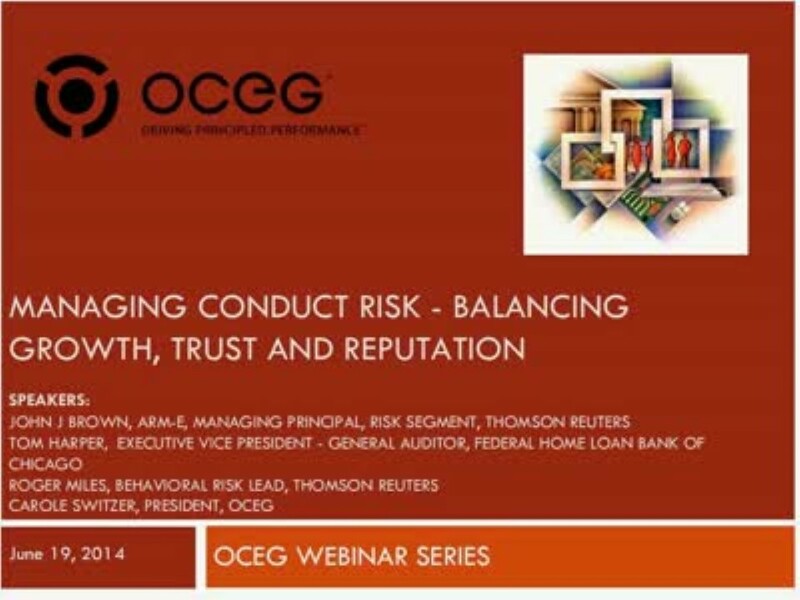 This webcast’s speakers will explore some of the important themes that are emerging as both regulators and the industry ponder the importance of risk culture, and the challenges around managing conduct risk. We have emailed instructions to access Managing Conduct Risk Balancing Growth Trust and Reputation to . Make sure the email arrives in your inbox: either add "support@oceg.org" as a safe sender to your email platform, or if you use Gmail, drag our email into your Primary tab.